Just a quick combo for you all to scope out today..
2 coats of the exceedingly gorgeous Barry M Gelly polish Blueberry - seriously, it is lovely.. 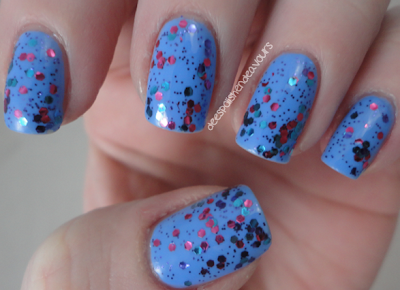 I could sport it all on its own, then I followed with a coat or two of OPI Polka.com - which I felt was a perfect fit. And it knocked two of my untried polish out. Yay! Well, back to studying. Have a great day everyone! !